Blend sugar in a mixer to smooth powder. Blend roasted rava with powdered sugar and keep aside. Add 2 tsp of cardamom powder to it and mix well. Heat 1 tbsp ghee in a kadhai and fry the dry fruits. Add it to the rava mixture. Heat enough ghee needed to make balls. When it becomes lukewarm, add it slowly to the rava mixture and make small balls. I used half cup of ghee to make ladoo. 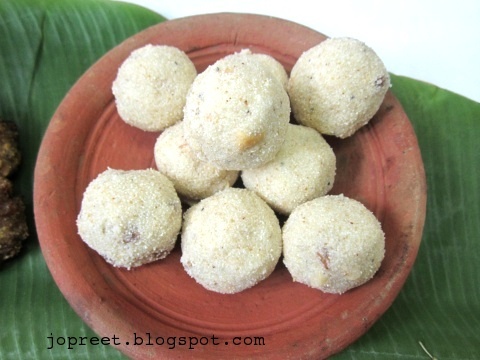 Adding ghee will increase the shell life of ladoo. You can also make use of milk instead of ghee, but its shell life reduces to 2-3 days. Store ladoos in an air-tight container and serve. Wish you the same preeti.All time fav & delicious.